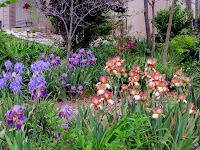 (1) Email photos to BVGardenClub@gmail.com and we will post them to the "Flowers" photo album. (2) Bring your photos on digital media to a club meeting and we will post them. (3) Send us a link to your online public photos and we will post that link here. It also includes building projects: totem pole, seawall and boathouse, deer fence, blue bottle tree, and Fairy Garden.